If you could rewind time 4.6 billion years, Earth was almost unrecognizable. There are no fossil records in this eon because temperature was too high to sustain life. 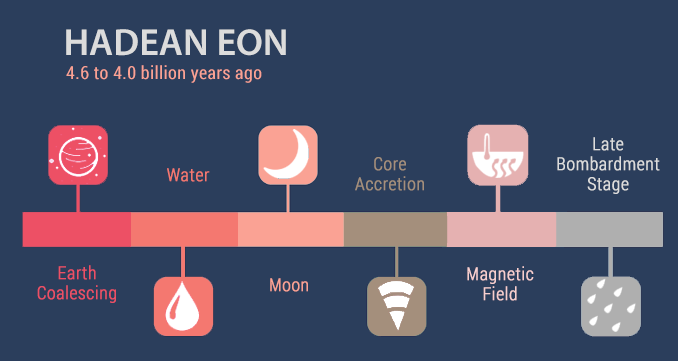 Some of the key events in the Hadean Eon is its heat source, magnetic field and formation of a moon. Let’s review some of the highlights from the first eon of Earth. But first, let’s review some of the key events in the Hadean Eon timeline. The Big Bang created all matter in the universe. This includes the sun, planets and our solar system. From a cloud of dust, gravity moulded our solar system. The terrestrial planets were positioned closer to the sun. After Mars, these are the gas outer planets. The core accretion model describes the creation of our solar system. Solar winds swept in hydrogen and helium closer to the sun because they were smaller in size. But heavier elements were not pulled into the sun. They spiraled and gelled together into planets of their own. Earth coalesced surrounding matter to form a sphere. 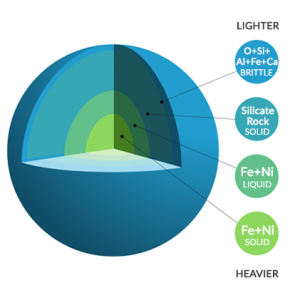 The heaviest material like iron and zinc sank to the core. Finally, lighter material remained on top to form a crust. From the core accretion model, Earth formed a solid iron core. Inside Earth, it was multi-family layered. 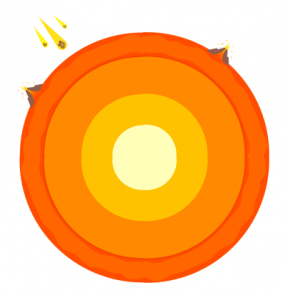 Surrounding the inner core, Earth established a liquid outer core. Because the solid inner core heats the outer liquid layer, it produces convection currents. 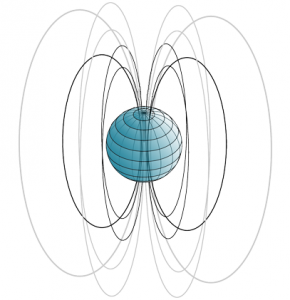 This geodynamo is Earth’s magnetic field. In the Hadean Eon, Earth’s magnetic field was just developing. It just started deflecting solar winds making Earth more habitable. Without it, Earth would be exposed to the sun’s deadly rays. And humans which didn’t exist at this wouldn’t have habitable conditions to evolve. 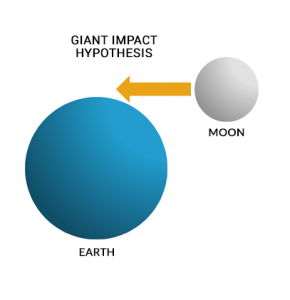 The giant impact hypothesis explains the formation of our moon. This happened sometime at the start of the Hadean Eon. First, an object the size of Mars headed towards Earth. At tremendous speed, it delivered a glancing blow to Earth. But Earth’s gravity was able to pull the moon into its orbit. And the moon has remained orbiting Earth ever since. The formation of the moon had profound effects for Earth’s climate. Not only did the moon slow down Earth’s rotation, but the impact tilted Earth on its axis. This is when the Earth started to have seasons. Because the moon stabilizes the Earth from wobbling, Earth also developed a more balanced climate. At the end of the Hadean Eon, the Earth was still in the late heavy bombardment stage. Asteroids and comets pelted Earth. We know it wasn’t only Earth because we can see these impacts all around our solar system. In the Hadean Eon, heat flow was nearly 3 times as high as it is today. Because of the intense heat, water would have evaporated into space. This is why scientists suggest that comets may have transported water during the late bombardment stage. And what was the spark that built the chemical building blocks for life? Scientists are trying to recreate the collisions that took place at this time. They are trying to reconstruct the first chains of DNA. In the Hadean Eon, we obtain a heat source, magnetic field and formation of a moon. There are no fossil records because temperature is too high to sustain life. The exception is there may be Hadean rocks in parts of Canada and Western Australia. Almost unrecognizable, heat flow is nearly 3 times as high as it is today from planetary accretion. How do we move towards habitability? 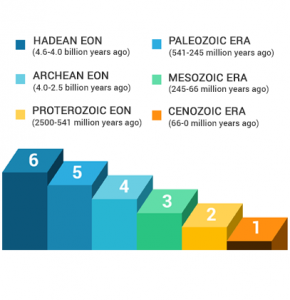 Scientists theorize that the Last Universal Common Ancestor (LUCA) emerges at the end of the Hadean Eon. This is the common ancestor that unites us all. Next comes the Archaean Eon which brings an oxygenated atmosphere from anaerobic organisms known as cyanobacteria.